OFFERING A BEAUTIFUL LIFESTYLEAbidos Hotels is a young and friendly brand that offers a fresh perspective in the regional hospitality industry with a distinctive approach to excellence. Our modern and trendy hotels are designed to provide guests an experience that is all about urban living. Life at Abidos Hotels is meant to be effortlessly simple for simplicity is the new luxury! Headquartered in Dubai, Abidos has been conceived to be a worldclass hotel management company. It aims to be a reliable partner for hotel developers offering flexible operator modules ranging from management to franchise, manchise and leasing. 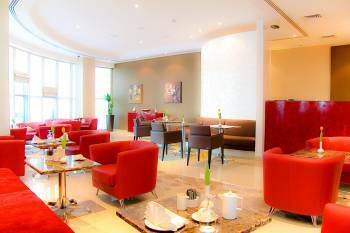 Local knowledge and understanding with international experience and expertise, create value for our associates.Abidos Hotel Apartment – Al Barsha and Abidos Hotel Apartments – Dubai Land features the below facilities:Abidos Hotel Apartments – Al Barsha is located at Barsha and within walking distance to the prestigious Mall of Emirates and Sheikh Zayed Road. It features 143 modern, fully equipped apartments of premium quality that includes a mix of One and Two Bedroom Apartments.Abidos Hotel Apartments – Dubai land is located at Dubai land within easy access to IMG world of adventure, Global village and Dragon Mart. It consists of 132 premium quality apartments that are fully equipped featuring a mix of One, Two and Three Bedroom Penthouse Suites.Apartments at both locations are designed considering the needs of international business and leisure travelers and offer a range of facilities such as en suite bathrooms, free Wi Fi, LCD TV, in room safe lockers, direct dial telephones, welcome tray offering complimentary water and tea / coffee facilities.Each apartment has a kitchenette with facilities that include a Fridge, Washing Machine, Micro wave and a cooking hobIn line with its policy of serving business travelers, our hotels offer a choice of meeting rooms and business center providing a range of services including photocopying, faxing and printing.When it’s time to relax, you can chill out on the attractive pool deck and sip a long cool drink at the pool bar.To help you get in shape there is a fully equipped gym with sauna and steam room.We look forward to welcoming you at Abidos Hotels.